I was involved last week in a Round table discussion on Education for All – Challenges in South Asia, organized by Aide et Action, an NGO which implements excellent vocational training programmes in the south, and more recently, in the north of Sri Lanka. Its programme is entitled ‘ILEAD’, and is based on the assumption that students need to be empowered, not only with skills, but also with the confidence to take initiatives on their own. Earlier this year I was privileged to attend an Awards Ceremony in Ambalangoda, along with the French ambassador, since the NGO is in France though it is now internationalized. The enthusiasm of the students, and also their commitment – in donating a computer to the Centre – was remarkable. More recently I gather the Centre in Vavuniya has had such a positive impact that the Commissioner General of Rehabilitation has requested their assistance for programmes for former Combatants too. Their characteristically comprehensive background paper had a section on Sri Lanka, which deserves citing in full. While they make no bones about laying the blame for the breakdown in education in the North, and the consequent suffering of children, on the LTTE, they also describe clearly the problems that remain, and which it is the responsibility of government to resolve. Thus the report makes clear that, while government has done much for the children it rescued, many are still not accounted for. Given the horrendous figure of children out of school in 2003 , when the LTTE was in full control of the area, it is obvious what was being done to them, but we must now check on what happened, and ensure psycho-social support both for those who survived and for the parents who still grieve for those taken away from them. The paper also goes straight to the point in noting the damage caused all over the country by inadequately trained teachers. That may not be the only reason that ‘school-based education is often perceived as irrelevant’ but the prevalence of a tuition culture all over the country, and particularly in urban areas where it is assumed there are sufficient capable teachers, testifies to the breakdown of what used to be the best educational system in South Asia. The paper also addresses the question of pre-schools, where we clearly need to do more. This is not seen as a government responsibility, and I can understand the reluctance of government to take it on, given the existing financial burden. But it is not acceptable that government should not ensure that pre-school children get the care and attention they need. I can only reiterate again that we have to change our mindset in all areas, to see government as the guarantor of education, not necessarily the provider. Encouragement of alternative delivery systems must accompany ensuring provision as well as quality. Nearly three decades of war between the Sri Lankan government and the LTTE group have devastated the education system in Sri Lanka and impacted it at all levels. In the Northern and Eastern provinces mostly affected by the conflict, the destruction of facilities in fighting, the closing of schools, and the appropriation of schools by the armed forces have led to shortages in infrastructure and services, and left large areas without sufficient schools. A Needs Assessment Report prepared by ADB, World Bank, and WFP in 2003 found that over 50,000 school-aged children in the region were out of school . Children have fallen severely behind in their schooling due to displacement, loss of family members, or forced participation in the armed conflict. 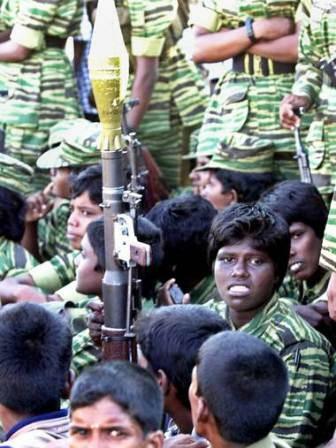 Over the course of the conflict, nearly 1 million people were displaced, and 6,905 children, 1,373 of whom are still missing, were recruited by the LTTE. Unfortunately, many of the children who were displaced are still excluded from the mainstream education system. In response to the specific needs of those children associated with armed groups, three rehabilitation centres have been providing education, care, psychological support and reunification assistance to 594 such children between 12 and 18 years of age. Although the success of these centres should not be diminished, the striking disparity between the number of children formerly associated with armed groups and those who have actually accessed such reintegration programs must be acknowledged and addressed. Going forward, it will be crucial to provide sufficient psychological support to all affected individuals in the wake of such conflict. Although the conflict has posed a major challenge to the availability of educational services, Sri Lanka faces additional, unrelated challenges, many of which are exacerbated in rural areas. A significant challenge, and one that likely contributes to low enrolment rates in secondary education, is the problem of inadequately trained teachers. Because teachers are often not appropriately trained in adapting the curriculum to address the local needs of the communities, school-based education is often perceived as irrelevant. Furthermore, inadequately trained teachers, the unequal distribution of teachers across regions, which preferentially favors urban centers, and the use of traditional and outdated teaching methods, particularly in rural areas, contribute to the lack of student achievement. As is the case in many countries, marginalized children, such as orphans, those with disabilities, and those involved in rural agriculture, are still excluded from the formal education system. Since the improvement of early childhood education was identified as one of the six primary goals of the Dakar Framework for Action, Sri Lanka has introduced a National Policy on Early Childhood Care and Development and drafted a National ECCD Act. (More info from 2008 MDA and 2012 Asia Report) Despite these advancements, pre-primary education is still voluntary and suffers from a lack of government oversight and funding. Due to the lack of public pre-primary education facilities, the burden falls on parents to pay for privately-run centres; as such, it is estimated that only 60% of Sri Lankan children receive these services, with only 6.7% coming from low income families.